Cannoli cream is one of my most favorite things. 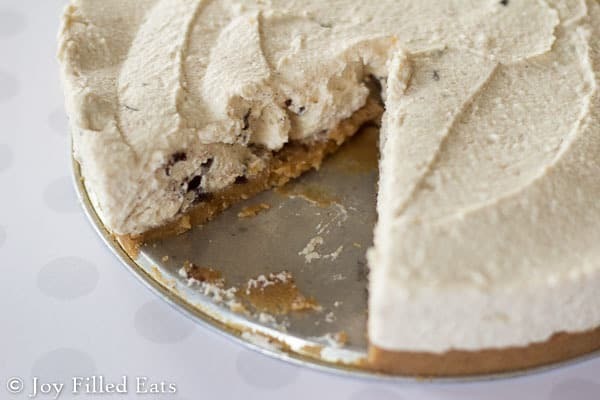 This Cannoli Cheesecake is creamy with all the flavors of a cannoli but lighter like a mousse. It is the perfect summer dessert. 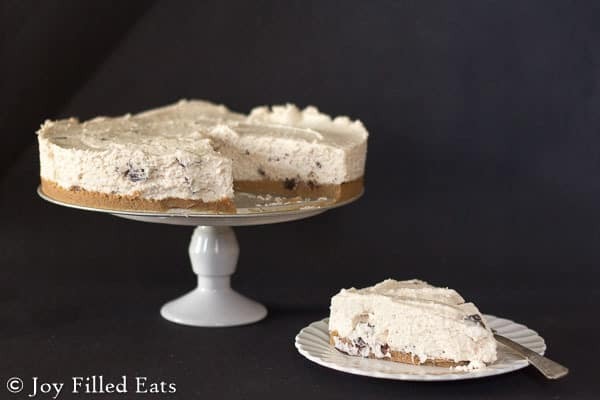 I already have a Cannoli Ice Cream that is out of this world and I’m sure this Cannoli Cheesecake won’t be my last cannoli recipe either. I’ve been wanting a cheesecake and since we are in the middle of a heat wave in NJ no bake was the way to go. 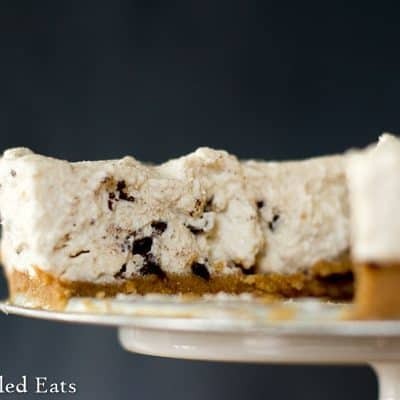 I love the no bake crust from Mrs. Criddle’s Kitchen that I used it in my Berries & Cream Ice Cream Pie and I’m using it for this cheesecake with two small tweaks. I added extra almond flour last time to thicken it so I decided to just cut back on the almond butter amount instead and I added cinnamon. Cinnamon is a key component in cannoli shells so I wanted the crust of this Cannoli Cheesecake to have that flavor. This Cannoli Cheesecake is creamy with all the flavors of a cannoli but lighter like a mousse. It is the perfect summer dessert. 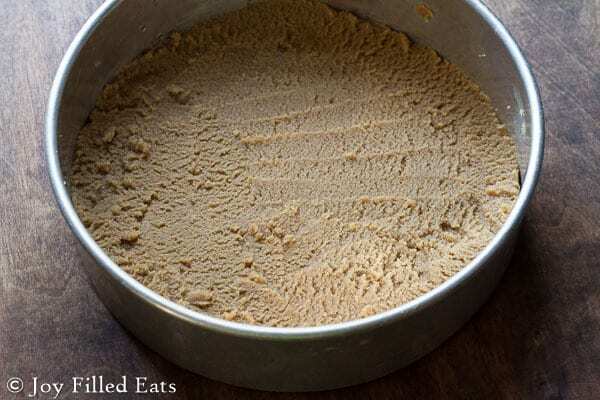 Make the crust and press into the bottom of a spring form pan. In the same bowl mix the ricotta, cream cheese, sweetener, cinnamon, and vanilla with an electric mixer until smooth. Mix in the gelatin. In another bowl, with the electric mixer, beat the cream until stiff peaks form. Fold 1/3 of the whipped cream into the cheesecake batter. Gently fold in the rest. Fold in the chocolate chips. Pour on top of the prepared crust. Refrigerate for at least 4-6 hours until it had firmed up a little more. It stays soft like a mousse. Love your recipes and looking forward to your book. Preordered one for sure! Yes, it does include the crust. Can you use maripone cheese is tread of riggatta? Do you strain the ricotta? No. If it has a puddle of liquid on top I would drain that off though. I want to try this.. i just have one question. It says tonuse 1/3 of the whipped cream. What do you do with the rest of the whipped cream? You use it all. "Fold 1/3 of the whipped cream into the cheesecake batter. Gently fold in the rest." It helps not to deflate by folding in 1/3 of it and then the other 2/3. This looks amazing! I have stevia, monk fruit sweetener, and erythritrol. Which would be best to use and how much would I use? I am new to using these sweeteners. Thank you! I would use the monk fruit sweetener if it is a blend like Lakanto. You will need twice the amount. Alternatively, you can mix my a batch of my sweetener using the erythritol and stevia (just use all erythritol) and use as directed in the recipe. I can't wait to try this! But I don't have some of those sweetners. I do have the pyure though how much would I use? I think it would be half the amount listed. I'd start with 1/4 of the amount and taste test. Can you make this a day ahead ? How long does it last in the fridge ? Yes. Up to a week. It freezes well too. The box didn't help with the serving sizes can you explain more. The serving for this is 1/12th of the cheesecake. The nutrition facts are for one slice. What is the carbs and serving size? Hi Danielle, I just added a nutrition box into the recipe card. I hope that helps! I made this tonight and it tastes just like a cannoli! Thank you for providing the tastiest treats. Your website has inspired me in so many ways. What is ricotta cheese milk? Can I utilize normal ricotta cheese? Whole milk ricotta cheese is normal ricotta. Ricotta comes in either Part-Skin or Whole Milk varieties. I recommend using Whole Milk ricotta for this recipe. I attempted this and the base looked nothing like in your picture. To me it looked like uncooked cookie dough,and it tasted the same. I ended up throwing the base out and making my own, as I didn't want to ruin the whole thing. I'm sorry you didn't like the base. 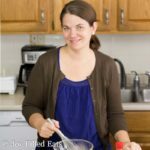 I've had many readers make this, a few other recipes I use this for, and the original on my friend Sarah's blog and this is the first complaint I've seen. 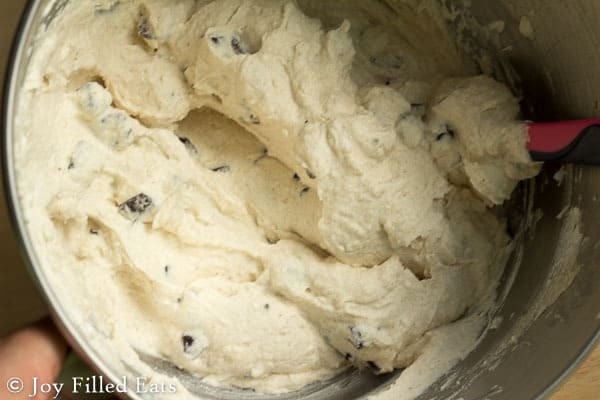 I personally like raw cookie dough and have several recipes that use it. 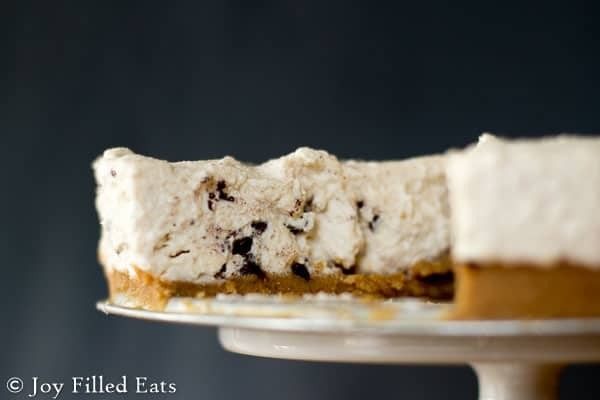 May I ask how you made your own no bake crust? I used one cup of almond flour, half a cup of desiccated coconut,a few tablespoons of flaxseed meal and melted butter to bind. Usually I make the base with LSA, desiccated coconut and butter. Is this a THM - "S"? I'm new to THM so if I make this I want to make sure I know where it lands. It looks oh so good, cannoli is my favorite!!! Do I need to do anything to the gelatin before adding it? Or do I just add the gelatin power as is? You just add it as is. A standard one. I think they are 9 inches. I won't matter too much for this recipe. You could even make it in a 9 x 13 and just cut squares.